Ever heard of Pi O’clock? Once a month on a Friday afternoon at 3:14 p.m. (wink wink), Solido Design Automation Inc. hosts an open and informal gathering of Saskatoon tech company folks at Innovation Place Research Park. Guests share ideas, learn from each other’s successes and failures and enjoy an end-of-the-week chill over a beer and snacks. Ever heard of Solido Design Automation? If you haven’t, you may wish to take a minute to learn about one of the leading lights of Saskatoon’s emerging tech sector. Solido creates software products used to make electronic chips. The company typically operates under the radar because it’s a privately-owned, business-to-business endeavour with no need for a flashy public profile. But that’s changing now that Solido is on a hiring binge. 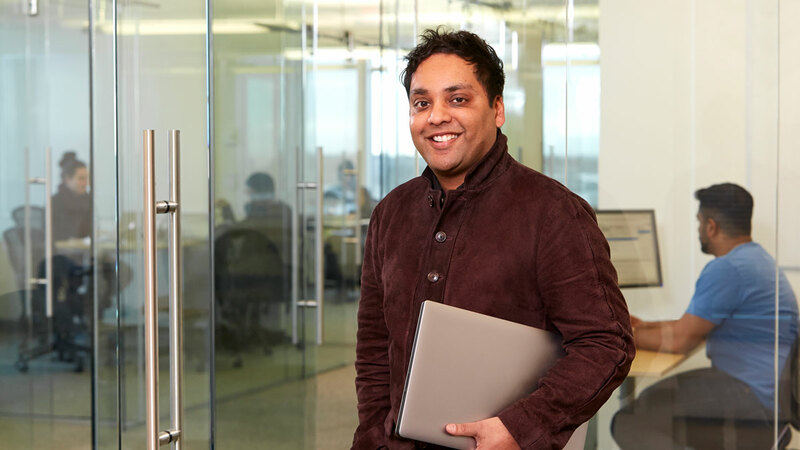 And the attention that company president and CEO Amit Gupta is seeking in order to land new employees is casting light on a dynamic young company with an impressive list of blue-chip clients. Solido increased its revenues by 50 to 70 per cent in each of the last five years. Gupta says plans to double staff to 100 employees over the next two years have been accelerated in order to reach a goal of 110 employees in one year. The company, which early on received about $10 million in venture capital funding from the labour-sponsored Golden Opportunities Fund Inc. and the Business Development Bank of Canada, spent more than a million dollars to upgrade its new 13,000-sq.-ft. office in Innovation Place. The new digs replace an office that’s less than half that size. Solido’s success earned it a place on the 2016 Deloitte Technology Fast 50 program that recognizes superior growth, innovation and leadership in Canada’s tech sector over the past four years. “The software that we make is used to produce the chips in literally billions of units of electronic devices that we buy every year,’’ says Gupta. “The companies that we’re selling to wouldn’t be buying our software if it wasn’t for the innovation that we have in the product.’’ Solido has 15 patents protecting its technologies and the company invests a good deal of money in research and development to continue to create new technologies. Gupta was born and raised in Saskatoon and holds degrees in electrical engineering and computer science from the University of Saskatchewan (U of S). He co-founded Analog Design Automation Inc. in 1999 and sold it in 2004 to Synopsys Inc., a world leader in semiconductor design software that’s based in California. He then canvased former customers to find out which big challenges they expected to face in years ahead. Smart phones were just entering the marketplace at the time and Gupta’s former clients told him they saw a need for a lot more functionality in small devices, and that chips would have to operate on low power in order for cell phone batteries to last all day. Solido is seeking to expand its ranks with computer scientists, engineers and mathematicians, and Gupta expects many of his new hires will be recent or experienced graduates from the U of S. Having that talent pool nearby is one of the main reasons that high tech companies like Solido are able to thrive in Saskatoon, he says. “Out of all the things you need to grow successful technology companies, the first is talent. Tech companies are really talent-based companies.’’ The second element is venture capital funding, and the third is good facilities such as Innovation Place that foster networking and the sharing of ideas. Gupta says there are about a dozen strong players in Saskatoon’s emerging technology sector. And while he suspects most people don’t know much about these companies, they provide good jobs with multiplicative benefits and diversification for the city’s economy.